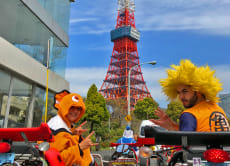 Hi, we are Go-Kart Roppongi. Good service and excellent time, thanks all! Great experience and a must do activity in Japan. Hiro was a great guide and led a humorous your. Must try! I am still beaming from the experience. What a fun find and way to see Tokyo! Wish I had done the two hours! You can get cool pictures in famous spots around the city, and a lot of attention everywhere you go. Also just a cool way to see the city. Thanks to Voyagin for the discount!